Indianapolis Pest control provides top-rated bed bug extermination services in Indianapolis, IN with amazing and lasting results. To get help or schedule an appointment, call our experts today at (317) 664-7873. Our bed bug exterminator Indianapolis services are available 7 days a week, 365 days a year for both commercial and residential clients. We only use the best pest control techniques to ensure your home or office gets the best bed bug treatment at an amazing price. Building on many years of bed bug extermination experience, we provide our clients in Indianapolis, IN with a fast service, discreetness, and maximum effectiveness. Our bed bug extermination service in Indianapolis includes a comprehensive treatment that is designed to provide sustained results and peace of mind for all of our clients. Our clients always receive the best possible pest control services, dedicated customer service, and a highly trained team who will entirely exterminate and solve your bed bug problem. Bed bug resurgences have had a major impact on bed bug exterminators in Indianapolis resulting in them needing to improve their treatments in order to out smart these pests. In order to get complete bed bug elimination, Indianapolis Pest Control uses a holistic approach made up of a highly effective treatment program. 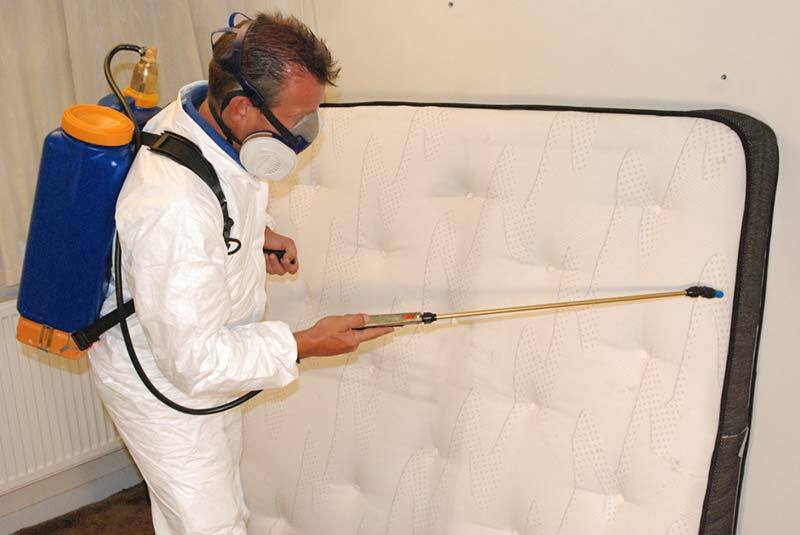 To get rid of bed bugs, the our extermination team will use a variety of equipment like steamers, heat treatment, targeted application of eco-friendly insecticides, and more. Hiring Indianapolis Pest Control means getting a professional exterminator that Indianapolis residents have relied on for years for customized treatment plans. Our plans are designed for success and total elimination of these unwanted pests. Our bed bug pest control service in Indianapolis includes tons of industry leading measures to completely remove and eliminate bed bugs form your home or office. If you believe you have a bed bug infestation call today at (317) 664-7873 and schedule a consultation to discuss extermination options. Say goodbye to scouring the internet for pictures of bed bugs or guessing what their bites look like. Our team can identify signs of a bed bug infestation in minutes! We’ll discuss the cost of exterminating bed bugs in Indianapolis and provide you with a detailed treatment plan and accurate estimate. What’s The Cost Of Bed Bug Control In Indianapolis? The cost of exterminating bed bugs in Indiana and the surrounding areas is dependent on the size of the property being treated and the level of severity of the bed bug infestation. Our pricing is based on multiple visit treatments using industry best practices in bed bug management and includes a comprehensive treatment protocol. To get detailed information, discuss the advantages, and discuss options of our top-rated bed bug extermination services in Indianapolis, give us a call at (317) 664-7873 today. If bed bugs have a single weakness, it’s their reproduction cycle. This is because it’s slower than most arthropods. By hiring a local bed bug exterminator, Indianapolis residents will have a top-rated expert who’s near by and available to perform multiple intensive treatments to disrupt their life cycle and prevent them from reproducing. Don’t panic and throw out upholstered items, clothing, furniture, and other valuable objects! Make sure you speak to our experts about scheduling an inspection and available treatment options. We will eliminate your bed bug infestation and get everything sorted out for you. We’ve helped people all over Indianapolis by exterminating some of the most difficult bed bug infestations. Call (317) 664-7873 today to learn more! The first step in bed bug eradication is an accurate identification of these pests. Starting with the first inspection, our team will assess and identify any and all possible hiding spots throughout your home or office. Using specialized cameras and high illumination lighting, we’ll look for signs of bed bugs everywhere they can hide. Bed bugs like to hide near to where we sleep or remain dormant for extended periods of time. Their black droppings are often found in the seams of mattresses or inside of box springs. They can also be found inside of and around nightstands, behind loose wallpaper, in general clutter, behind headboards, and in any other nearby furniture. Our team will use their experience and training to provide you with a detailed inspection and assessment. Bed bugs are tiny insects. Full grown, they’re about the size of an apple seed. Upon maturity, the full grown bugs have oval bodies that are flat and the color of red rust. Bed bugs are typically active at night when most people are asleep. Though full grown bed bugs can be seen easily, they are great at hiding in places that make them very hard to find. Some places where they like to hide include walls, the floor, along the seams of mattresses, and in furniture as discussed above. 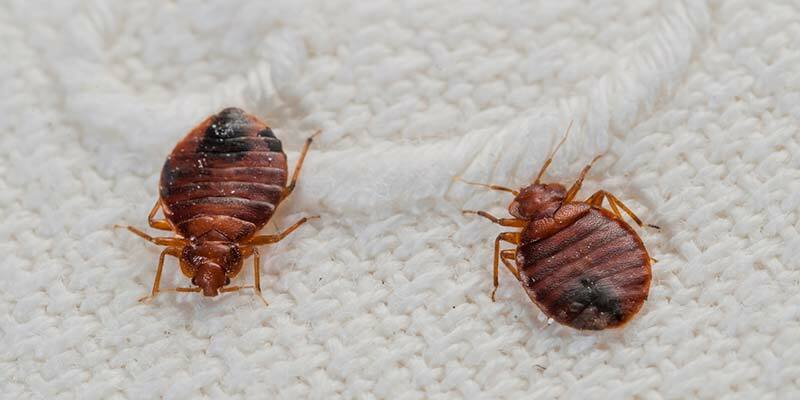 Other signs of a bed bug infestation in Indianapolis include bites on your body, small bloodstains on your bed, and tiny dark spots of waste. Bed bug bites are a telltale sign that you have these pests. It’s also an excellent way of identifying them as the problem you’re experiencing. Often located on your shoulders or arms, bed bug bites tend to be red and itchy. One distinction of bed bug bites that sets them apart from other bugs is that their bites tend to be in a straight line. Though the insects don’t seem to carry any specific diseases, their bites can lead to intense scratching and possible infection. In addition, some people have been found to be allergic to them. A bed bug begins its life as a tiny egg that measures about one millimeter long, or the size of a pinhead. The eggs are pearl white in color. They undergo five nymph stages with a growth of about half of a millimeter during each stage. These young bugs tend to be a white-yellowish color or can be translucent. In fact, they’re nearly invisible to the naked eye if they haven’t fed recently. Adults generally measure between five and seven millimeters in length. They can have a sweet musty odor that comes from the glands along the sides of their bodies.